Brian Wilson is one of a very few number of artists, that I feel comfortable about being referred to as, a musical legend or the like. It's not just the fact that he overcame his personal health difficulties, that kept him out of the music scene for so long, that gives him the right to such accolades. For me it is the music. Pure and simple, just that - the music. His contribution to the Beach Boys legacy in recent years, and the stunning recreation of so many classics live, along with some newer material, has been the proverbial 'breath of fresh air' popular music so often begs for. This is Brian Wilson at the Roskilde Festival in Denmark in 2005. The annual Roskilde festival has a number of synergies with the UK's Glastonbury festival amongst others, their web site is well worth a visit, I wonder if getting tickets is just as difficult? Therefore it is no suprise that he played Glastonbury just a few days earlier, as part of the Smile tour from that year. 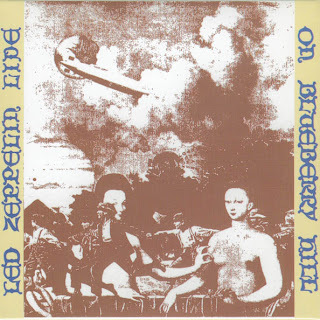 When I was a mere young lad in my teens, this Led Zeppelin bootleg was often talked of, in 'hushed undertones', however neither my friends or I ever owned a copy. For a while it became something of a status symbol to have heard it, or even know of someone, that had a copy. In reality as far as bootlegs go this really is something special. Cutting and pasting shamelessly from Wikipedia, (where this boot has it's own entry!) here is a rough history of the bootleg. Live On Blueberry Hill (also known as Blueberry Hill) is an audience recording. It is well known for being one of the first ever Led Zeppelin bootlegs, and indeed one of the first ever rock and roll bootlegs ever released. It was initially released on the Blimp label. The sleeve notes described it as "One hundred and six minutes and fifty three seconds of pure alive rock." The album was subsequently pressed on the Trade Mark of Quality label and shipped to England. Hootie and the Blowfish originally formed at the University of South Carolina back in 1985, the line up being, Darius Rucker, Dean Felber, Jim "Sonny" Sonefeld and Mark Bryan. This is an acoustic gig, with some extras, that having listened to earlier today, sounds really good. I am not that familiar with their music, however having enjoyed this, I will be checking out some more! Plus recorded at GLR (BBC Radio) London on the 1st May 1996 (acoustic session).